Some dogs don't take a day off. Consider this off-duty K9. He could be doing anything in his free time. But, as seen in a video posted on Facebook, this dog brings hanging out to a whole new level. 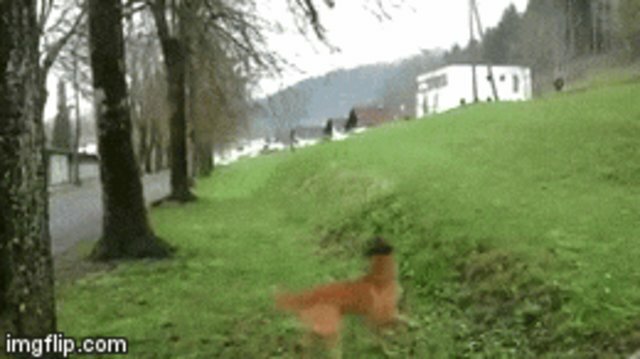 In the clip, the dog is seen chasing a stick. And not just any stick - one that hasn't even technically become a "stick" yet. As in branch. The dog takes several spectacular runs at the branch. Finally, he makes contact. Then he dangles and dances, jaws locked on, trying with all his might to convince the branch that it would like to become his stick. We don't know if it finally surrenders and snaps. The video ends abruptly with the dog mid-shimmy, determined to take this branch into custody. Will this fugitive branch come quietly? We kind of hope not. Because this is the kind of police work we could watch all day.